through the opening at such a great velocity that there will be a very rapid erosion at the joint. After a few shots, the damage caused by the erosion could be so great that the gun may fail to function or at least may become unsafe for further use. Blast and erosion arc not the only difficulties which can result from ineffective sealing at the joint between the cylinder and barrel. It must be realized that the powder gas pressure continues to act at the joint for the entire time the projectile is being driven through the gun bore. If the leak is bad enough to permit the escape of any significant amount of the powder gases during this time, there may be a considerable loss in the muzzle velocity of the projectile. There are three basic methods which have been used over the years for the purpose of scaling the joint between the cylinder and barrel to prevent the cscapc of the powder gases. The oldest of these methods has been used ever since the day of the flintlock and cap-and-ball revolvers and consists of a device for camming or wedging the cylinder forward before the gun is fired. This action closes the chambcr gap and presses the forward face of the cylinder lightly against the rear face of the barrel. 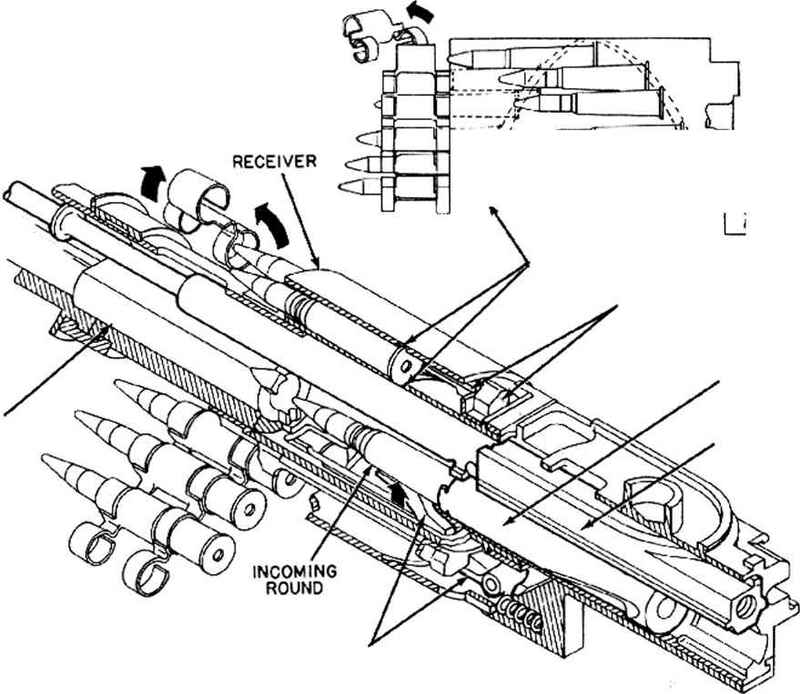 Another arrangement, which was conceived as soon as metallic cartridge ammunition came into general use, is to move the cartridge forward before the gun is fired so that the neck of the cartridge case is moved over the chamber gap and enters the barrel for a short distance. When the cartridge is fired, the neck is expanded and tightly seals the gap. The third method is that used in most of the present-day revolver cannons. This method uses a sealing piston or sleeve at the front end of each chambcr opening in the cylinder. As the projectile passes through the sleeve, the force of the explosion drives the sleeve forward and holds it tightly against the rear face of the barrel until the pressure within the bore decreases to a relatively low value. Thus, during the action of the powder gas pressure, the sealing sleeve spans the chamber gap and holds the leakage to a minimum. In the following paragraphs, the three sealing methods mentioned here arc analyzed to indicate the nature of the design problems involved in each of them and to explain further their functioning. The method of camming the cylinder forward to effect the seal may take several forms. In its simplest form, the rear of the barrel and the front of the cylin der are merely machined to a smooth flat surface so that they will mate closely when the cylinder is cammed forward. Although this method has the advantage of case of manufacture, it is not very effective because of the virtual impossibility of insuring a tight metal-to-mctal contact around the entire periphery of the joint. Any slight defect of the surfaces, or the presence of particles of dirt or fouling in the joint, will adversely affect the sealing action. Even a small inaccuracy in the squareness of the mating surfaces or in the axial alignment of the mechanism will cause a gap to exist over a portion of the joint. If there is an imperfect seal for any of these reasons, the enormous pressure of the propcl-lant explosion will force high-speed jets of extremely hot gas through the gaps. The resulting erosion will quickly ruin the mating surfaces and make further sealing impossible. Because of the sensitivity of this method to slight defects, it is not suitable for use in high-powered weapons. A great improvement in the sealing action can be obtained by machining a conical surfacc at the rear of the barrel to mate with a conical counterbore at the forward facc of the cvlinder. When the cvlinder is cammed forward, the surfaces have an action similar to that of an automobile valve. In moving together, the tapered surfaces have somewhat of a self-aligning action and under the high pressure of the camming mcchanism, a metal-to-metal contact over a considerable area is more probable than with flat surfaces. However, with steel mating surfaces, the sealing action is still seriously affected by the presence of dirt or surfac e defects.